Tuesday night an all new House Hunters International aired featuring Toni DeBella, who is the adventurous soul behind Orvieto or Bust. She is also a contributing writer for the Italian Notebook. Toni is one of those people on our list of inspirational people. Like I have said before, we “collect” other expats and follow their blogs with crazy dedication. Regularly keeping up with the adventures of these trail blazers helps to keep our eye on the prize. I guess you could say it is our version of a vision board. Any HHI episode EVER in Italy is also a part of our vision board. Yes, we know the whole thing is staged. We don’t care. 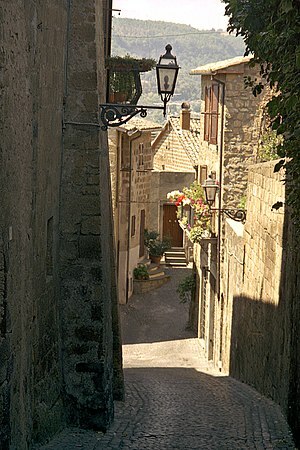 We just want to see the beautiful scenery and the interesting way people live in other countries, particularly Italy. We like to drool over the adorable winding cobblestone streets, the gorgeous architecture, the flowers, the vistas. We just drool. And we imagine. We imagine ourselves walking those same streets. We pick which of the three apartment choices we would live in. We completely mentally put ourselves there. I’m a firm believer that when you have a long-term dream, you have to be diligent about keeping the dream alive, keeping the dream in front of you at all times. Never put your dream on the back burner. Thanks, Toni, for helping to keep our fire burning. We’ll be seeing you soon!